Update: Sakyong Mipham Rinpoche is not currently teaching whilst allegations of misconduct are investigated. Please refer to our resource page for more information. Sakyong Mipham Rinpoche is the spiritual director of Shambhala. He also holds the Kagyü and Nyingma lineages of Tibetan Buddhism. He is the son of Chögyam Trungpa Rinpoche. His background embraces both Eastern and Western cultures. Born in India in 1962, he received spiritual training from his father and from many of the greatest Tibetan Buddhist masters of our time. 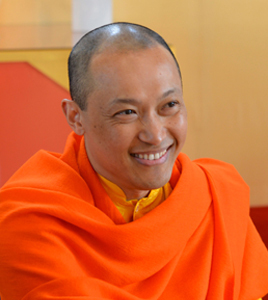 He is renowned for his straightforward, practical approach teaching style and his skill at making even the most esoteric Buddhist teachings meaningful and relevant to an Western audience. The Lost Art of Good Conversation: A mindful Way to Connect with Others and Enrich Every Day Life uses Buddhist principles and the practice of meditation to explore how we can deepen and strengthen our connections with others. The Shambhala Principle: Discovering Humanity’s Hidden Treasure explains the Shambhala principle of ‘basic goodness’ and ‘enlightened society’ and is written as a dialogue with his father, Chögyam Trungpa. His bestselling book, Turning the Mind into an Ally, is a perfect handbook for starting a personal meditation practice. A keen marathon runner one of his many books Running with the Mind of Meditation describes how physical activity can support spiritual well-being. 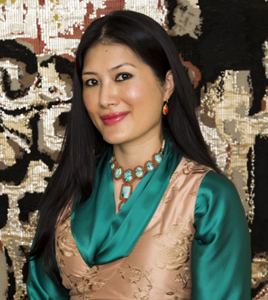 Khandro Tseyang is the wife of Sakyong Mipham Rinpoche and honoured with the title of Sakyong Wangmo. She is from a very old Tibetan family which fled from Tibet to South India and Nepal after the Chinese invasion. Born in Orissa she is the youngest daughter of His Eminence Terton Namkha Drimed Rinpoche, the sixth throne holder of the Ripa family lineage and the Ripa monasteries. Her grandmother, Mayum Palden Tsomo, was an advanced Dzogchen practitioner and the granddaughter of the yogini Drubwand Shakya Shri. Her mother, Sangyum Chime Dolkar, is regarded as an emanation of Red Tara. Educated at an English school, Khandro Tseyang studied Tibetan texts with her grandmother in the evenings and was educated in the tradition of Gesar of Ling dances with the Lingdro dance ensemble which her father founded. It was dancing with the ensemble that she met Sakyong Mipham Rinpoche in 2005. They were married on 10 June 2006. In August 2008, she were enthroned as Sakyong Wangmo by His Holiness Penor Rinpoche. The Shambhala teachings have basic goodness as their foundation, which is inherent in every human being as their birthright. According to the Shambhala view, the Sakyong and Sakyong Wangmo are examples of these awakened qualities which every human being can discover.